I'm trying to decide what to use in my 55 for water dishes. I like the ones that Phoebe (on Etsy) makes, but I worry about my teeny and small guys with the 3" depth. I asked her about doing one with a small shallow end of 1", then having the slope to the deeper part. She is only doing the standard design right now. Also, my crabs don't ever seem to want to go into the water so I wonder if it's necessary to have the depth. Right now I have PPs and I might be getting an E tomorrow (I'm adopting some and not certain of what the one is). My thoughts on future new crabs are Es or Ruggies. I might think about Straws also. I thought I had this figured out because my crabs are all teeny to a medium that is on the small side. My plan was to get the medium size of the All Living Things medium soaking ponds - one corner one and one regular one. This is the one: www.petsmart.com/product/index.jsp?productId=3973412 The corner one allows for water depth of 1" to 1 1/4" and the regular one is slighly less (like an 1/8" less). I like the look of these and they are textured so the crabs can get out easily. Here's the issue. 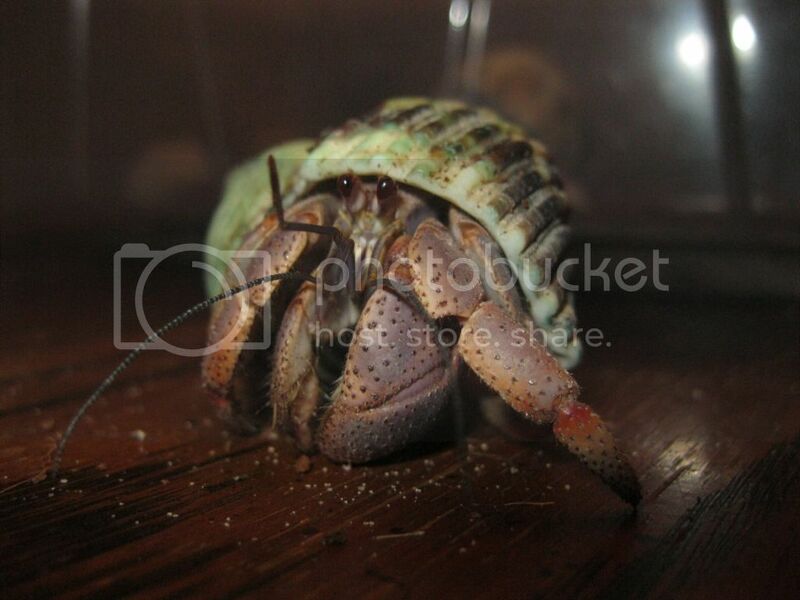 I'm adopting 5 crabs tomorrow and from the pictures I think one of them is either a big medium or a large. So for the species I'm considering in the near term (PP, E, Ruggie, maybe Straws) how deep does the water need to be for them? Which species really need to fully submerge? A question on top of my question. For those of you who have the clay pools by Phoebe, do you filter them? If not, how often do you change the water and how much do they hold? Well....let's see. My PPs have not liked the dishes when they were deeper and I have heard the same from a lot of other people. I have 3 pretty good size guys (big larges) and even they don 't go in the water when it's deeper that about an inch. Now, as for the bowls, I have no personal experience with them, but I can tell you that a lot of people recommend the "Groovy Jacuzzi" dishes and here is one about the same dimensions as the bowl you linked to, but cheaper and as I said, one a lot of people recommend. (It's even on sale right now,hh) They also have a lot of really cool dishes that are like little lagoons, that are here. I'm getting ready to do a 55 myself and these are some of the same things I am trying to decide on for mine. I don't currently have any exotic species, but the PPs I have and have had before, never seemed to go for deep water. Hope this helps! I use 2 Fluker's Groovy Jacuzzi's. They have steps and come in differant sizes. Plus is has a lip edge all way around. I change my water every 2nd - 3rd day. I really like them. haha I just use A Cd container from walmart and a glass candy dish from wally worlds Decor section. The depth seems to be okay for the crabs. I might switch to two canDy dishes though. check out my tat pics to see my dishes they work for me but my PP's seem to like the wider lip at the edge because it is better for sitting. my PP's don't really go in but I like for them to have the option (of course someone falls in on occasion!). I think you said you thought you maybe getting an E? If so I have read where E's are sometimes found drowned in the water, why who knows but I would just be sure that there is a good way to get in and out, especially for small crabbies. Groovy jacuzi's look neat seem washable and have steps but I've never had one. Heard good things though. Yeah, as many of you know, I use a mushroom tub and a glass candy dish right now. but I hope to get more "natural" looking ones for the 55. I have heard good things about the groovy jacuzzi and I like how it looks, but I too have PPs that would rather sit & dangle their feet than go in and so wonder if the lagoon would be better. I think Mel got a couple for her big tank. I do think though from watching my guys that the little guys are often much better at getting in & out of things than people think; but I don't have teeny or micro crabs either. I have the dishes made by Phoebe. They are tectured in a way that the most tiny crab can climb any side. I also have a hut she made me.. something about the tecture of the clay attracts the crabs, they love to hang out around the edges of the pool and all over the hut. I do not filter them.. I use a turkey baster and change the water every other day. Once a week i take out the bowl and give it a good wash. The clay does not hold dirt and washed clean with just a sink spray. The dishes are dish washer safe if it ever did get that dirty. The deepness helps keep dirt out of the water. The water is enough to last without ever having to worry about it drying out. You can put stones in the bottom of it if you wanted it to hold less water. Each bowl holds about a quart of water. I also like that it does not take up molting space from the crabs because it sits on the top of the ground. I have been through many bowls untill i found them and I just love them. I wish I had the camera last night. Man o man. It was great. Kermit & Mr.Sympathy were chilling out on the edge of the pool. Kermit was drinking from it when I decided to turn in for the night. It was like a social between the two. They are the only ones up currantly. I think Rasta decided to go and destress after my photo shoot the other night. ahhh water dishes... well I use several different types. I use phoebe's in my biggest tank for the PP's and straws. Some like it some don't. The medium repti rocks are the most popular in every tank. I have groovies too, also well liked. Then I got the is beach bowl from reptile supplies, it is by far my favorite for salt water... perfect. But if I put repti rocks in there, they will stop using the beach one for them. GJ's these are great, but your crabs will get under them... they love it there. Okay, cool. What are the dimensions on those medium repti rock dishes? It doesn't say on the site. I like the look of the repti rock ones and if the crabs all seems to like them that's even better! I have a bunch of those repti rock ones at home. the Beach looks nice.